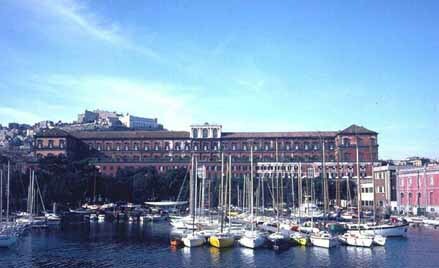 Overlooking the Bay of Naples is the long red southern facade of the Royal Palace. It is one of four palaces that the Bourbons of Naples used during their rule of the Kingdom of Naples (1730-1860): one is in Caserta, another at Capodimonte overlooking Naples, and the third is in Portici on the slopes of Vesuvius. Those three were actually built by the Bourbons. This one, however, is somewhat older. The building was actually conceived by Ferdinando Ruiz de Castro, Count of Lemos, Spanish viceroy in Naples between 1599 and 1603, to be a fitting residence for King Phillip III of Spain, who was planning a visit to the city. The architect chosen was Domenico Fontana (1543-1607). The building was put up on the site of the older Spanish vice-royal residence (the link in the small yellow circle on this 1566 Laffréry map). From the original version of 1600, the palace has undergone numerous architectural additions and changes, including some by Luigi Vanvitelli in the mid-1700s and then by Gaetano Genovese in 1838 after a fire had damaged much of the palace. The main entrance is on the west side of the building on Piazza Plebiscito, where the facade displays a mini-history lesson: statues of the rulers of the eight dynasties to rule Naples since the foundation of the Kingdom of Naples in the twelfth century. They are, from left to right: Roger the Norman, Frederick II of Swabia, Charles of Angiò, Alfonse of Aragon, Charles V, Charles III of Bourbon, Gioacchino Murat, and Victor Emanuel II. From the main entrance you can enter the palace grounds and visit most of the building. The central courtyard contains the bronze portals that were once part of the Maschio Angioino (or Castel Nuovo), and in the inner courtyard there is a cannonball embedded in one of the gates such that it could only have been fired from inside! Either that, or, the story goes, the gate was taken as booty by Charles VIII of France, whose ship was attacked on the way back to France by the Genoese. The gate was set up to ward off a cannonade and one of the balls got stuck. The gate was subsequently returned to Naples by the victorious Genoese and put back in place, cannonball and all. Today the palace and adjacent grounds house the San Carlo Theater, a museum, the National Library of Naples and a number of offices, including those of the regional tourist board. Also, the premises serve for various art shows and exhibits throughout the year. An irony connected with the Royal Palace is that Phillip III never got around to visiting the city and staying in the house built just for him.